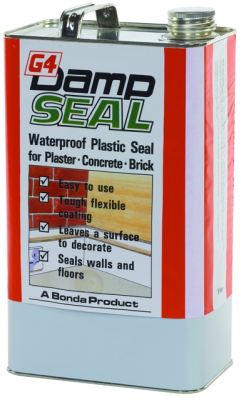 G4 Damp Sealer - Industrial Plasters Ltd.
G4 Sealer is a non-porous sealer ideal for sealing plaster and concrete models when moulding in hot-melt vinyl. G4 is also recommended by all the major polyester resin manufactures as a bonding primer between polyester resin (G.R.P.) and materials such as wood, metal and concrete. Brush on a coat of G4 to the clean base substrate. As soon as it is finger tacky but within 4 hours apply the polyester resin and glassfibre (G.R.P) laminate. G4 can also be used for sealing damp out from concrete, stone, brick and wood with a hard wearing, non-porous, flexible plastic coating. It can be applied in high humidity environments and in conditions as low as 0C. For a sealer three coats is the recommended amount, 1ltr will offer a coverage of approx 2sq meters at three coats.